These regulations are applicable to 1/32 scale models of group GT3 racing cars. This formulae is based on using readily available ready-to-run (RTR) slot cars and components that can be ordered from any slot car retailer. 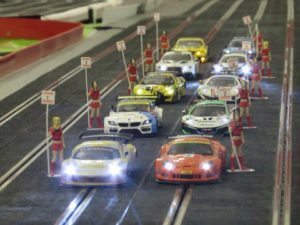 The standard allows cars from slot car manufacturers such as NSR, Scaleauto and Black Arrow, as well as kit and upgrade builds using aftermarket chassis including 3D prints. Prior to 2018, previous technical regulations split the approved bodies and homologated chassis into a separate list. From version 6 onwards, the regulations and the approved models and chassis lists are combined into a single document. Below you will also find a link to a welcome pack presentation which gives a basic summary on the structure of the series, the technical specification of the cars and other important information for racers who may be looking at DiSCA competition for the first time. ERROR: Error validating access token: Session has expired on Thursday, 04-Oct-18 08:02:04 PDT. The current time is Saturday, 20-Apr-19 17:51:26 PDT.